Welcome to the first lesson in the Use Vector Spatial data in Open Source Python - Geopandas module. This tutorial covers working with spatial data in vector format in Python. You will learn how to import, manipulate and map shapefile data in python. Finally you will learn how to reproject vector data into different coordinate reference systems. How Many Features Are In Your Shapefile? 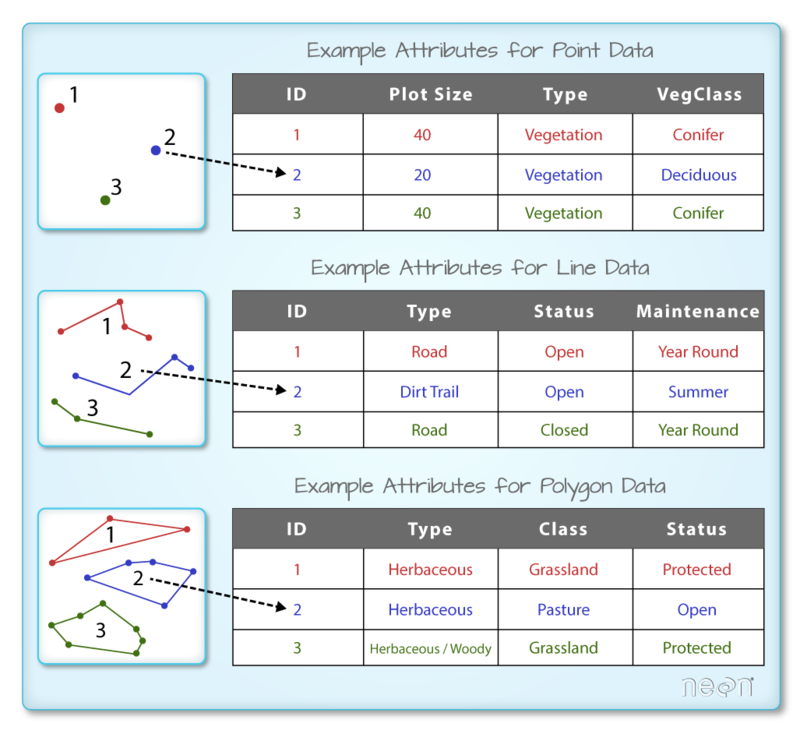 Describe the characteristics of 3 key vector data structures: points, lines and polygons. Open a shapefile in Python using geopandas - gpd.read_file. Access and view the attributes of a vector spatial layer in Python. Points: Each individual point is defined by a single x, y coordinate. There can be many points in a vector point file. Examples of point data include: sampling locations, the location of individual trees or the location of plots. Lines: Lines are composed of many (at least 2) vertices, or points, that are connected. For instance, a road or a stream may be represented by a line. This line is composed of a series of segments, each “bend” in the road or stream represents a vertex that has defined x, y location. Polygons: A polygon consists of 3 or more vertices that are connected and “closed”. Thus the outlines of plot boundaries, lakes, oceans, and states or countries are often represented by polygons. Occasionally, a polygon can have a hole in the middle of it (like a doughnut), this is something to be aware of but not an issue you will deal with in this tutorial. Data Tip: Sometimes, boundary layers such as states and countries, are stored as lines rather than polygons. However, these boundaries, when represented as a line, will not create a closed object with a defined “area” that can be “filled”. Geospatial data in vector format are often stored in a shapefile format. Because the structure of points, lines, and polygons are different, each individual shapefile can only contain one vector type (all points, all lines or all polygons). You will not find a mixture of point, line and polygon objects in a single shapefile. Objects stored in a shapefile often have a set of associated attributes that describe the data. For example, a line shapefile that contains the locations of streams, might contain the associated stream name, stream “order” and other information about each stream line object. More about shapefiles can found on Wikipedia. A text file is often self contained. For example, one .csv file is composed of one unique file. Many spatial formats are composed of several files. A shapefile is created by 3 or more files, all of which must retain the same NAME and be stored in the same file directory, in order for you to be able to work with them. .shp: the file that contains the geometry for all features. .shx: the file that indexes the geometry. .dbf: the file that stores feature attributes in a tabular format. These files need to have the same name and to be stored in the same directory (folder) to open properly in a GIS, R or Python tool. .prj: the file that contains information on projection format including the coordinate system and projection information. It is a plain text file describing the projection using well-known text (WKT) format. .sbn and .sbx: the files that are a spatial index of the features. .shp.xml: the file that is the geospatial metadata in XML format, (e.g. ISO 19115 or XML format). When you work with a shapefile, you must keep all of the key associated file types together. And when you share a shapefile with a colleague, it is important to zip up all of these files into one package before you send it to them! 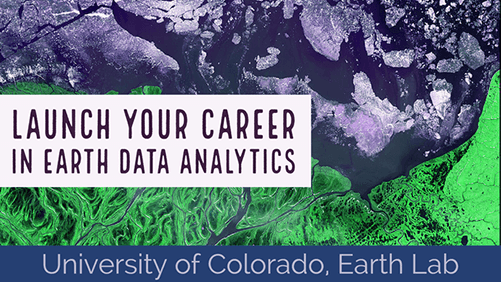 You will use the geopandas library to work with vector data in Python. You will also use matplotlib.pyplot to plot your data. A point shapefile representing the location of field sites at the San Joachin field site. The first shapefile that you will open contains the point locations of plots where trees have been measured. To import shapefiles you use the geopandas function read_file(). Notice that you call the read_file() function using gpd.read_file() to tell python to look for the function within the geopandas library. The CRS UTM zone 18N. The CRS is critical to interpreting the object extent values as it specifies units. Each object in a shapefile has one or more attributes associated with it. Shapefile attributes are similar to fields or columns in a spreadsheet. Each row in the spreadsheet has a set of columns associated with it that describe the row element. In the case of a shapefile, each row represents a spatial object - for example, a road, represented as a line in a line shapefile, will have one “row” of attributes associated with it. These attributes can include different types of information that describe objects stored within a shapefile. Thus, our road, may have a name, length, number of lanes, speed limit, type of road and other attributes stored with it. You can view the attribute table associated with our geopandas GeoDataFrame by simply typing the object name into the console (e.g., sjer_plot_locations). Or you can use the .head(3) function to only display the first 3 rows of the attribute table. The number in the .head() function represents the total number of rows that will be returned by the function. Data Tip: The acronym, OGR, refers to the OpenGIS Simple Features Reference Implementation. Learn more about OGR. Notice that the geopandas data structure is a data.frame that contains a geometry column where the x, y point location values are stored. All of the other shapefile feature attributes are contained in columns, similar to what you may be used to if you’ve used a GIS tool such as ArcGIS or QGIS. When you import the SJER_plot_centroids shapefile layer into Python the gpd.read_file() function automatically stores information about the data as attributes. You are particularly interested in the geospatial metadata, describing the format, CRS, extent, and other components of the vector data, and the attributes which describe properties associated with each individual vector object. Object Type: the class of the imported object. Coordinate Reference System (CRS): the projection of the data. Extent: the spatial extent (geographic area that the shapefile covers) of the shapefile. Note that the spatial extent for a shapefile represents the extent for ALL spatial objects in the shapefile. The CRS for our data is epsg code: 32611. You will learn about CRS formats and structures in a later lesson but for now a quick google search reveals that this CRS is: UTM zone 11 North - WGS84. Also note that the number of columns includes a column where the geometry (the x, y coordinate locations) are stored. You can quickly plot a geopandas dataframe using the .plot() method. You do not have to setup an axis or figure object to create this quick plot. You then plot the data and provide the ax= argument with the ax object. If you do setup an axis or figure object to create a geopandas plot, then you can easily customize the plot later. Note that you can name that axis whatever you’d like. Below it is called ax1 instead of ax. Spatial plot of SJER plot locations using Geopandas with matplotlib axes defined. categorical=True: set the plot to plot categorical data - in this case plot types. title add a title to your plot. and fig size if you want to specify the size of the output plot. Spatial plot of SJER plot locations using Geopandas with a legend and title. You can use the cmap argument to adjust the colors of our plot. Below you used a colormap that is a part of the matplotlib colormap library. Finally you use the marker= argument to specify the marker style. Spatial plot of SJER plot locations using Geopandas with custom marker colors and size. Using the steps above, import the data/week5/california/madera-county-roads/tl_2013_06039_roads and data/week5/california/SJER/vector_data/SJER_crop.shp shapefiles into Python. Call the roads object sjer_roads and the crop layer sjer_crop_extent. What type of Python spatial object is created when you import each layer? What is the CRS and extent for each object? Do the files contain, points, lines or polygons? How many spatial objects are in each file? Define the ax variable just as you did above to add a title to our plot. Then you add as many layers to the plot as you want using geopandas .plot() method. plt.axis('equal') is used to ensure the x and y axis are uniformly spaced. Spatial plot of SJER plot locations layered on top of the plot boundary.